The thread (M12) of this stainless steel anchor is screwed through a steel surface (min. 5 mm) and countered accordingly. Alternatively, it can also be screwed into a pre-installed female thread. This anchor, which is capable of restraining loads in all directions, can also be installed overhead, if required. 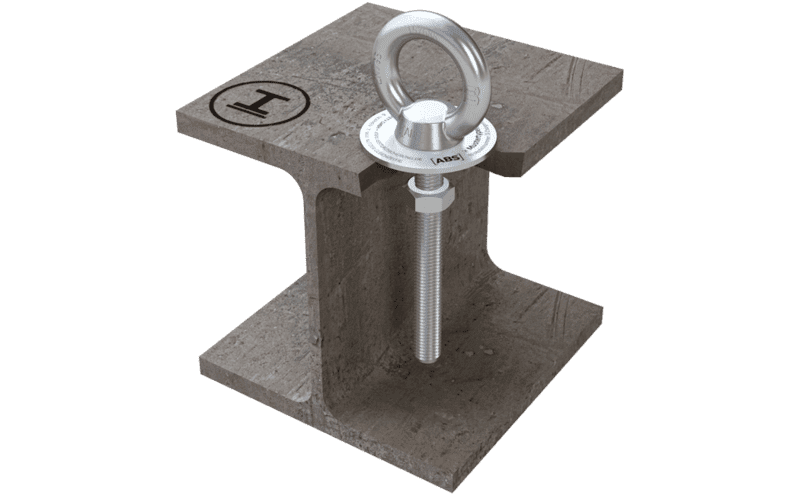 Our stainless steel ABS-Lock IV-ST anchorage point for steel applications offers you 2 installation scenarios: You can either screw it through a steel structure and counter it on the other side using a nut or insert it straight into a pre-drilled threaded bore (M12). Regardless of which type of installation you decide to go for, this anchorage device can cope with all directions of load. When implemented as a single anchorage point to secure 1 individual, our ABS-Lock IV-ST offers you an excellent fall arrest solution for an industrial hall - or virtually anywhere with a load-bearing steel structure. As this anchor has been tested for overhead usage, you can also combine it with a self-retracting lifeline.